This project is financially supported by the HERA Joint Research Programme (www.heranet.info) which is co-funded by AHRC, AKA, DASTI, ETF, FNR, FWF, HAZU, IRCHSS, MHEST, NWO, RANNIS, RCN, VR and the European Community FP7 2007-2013, under the Socio-economic Sciences and Humanities programme. Paris, BNF, fr. 1553, fol. 520v, shows a religious work, ‘L’ave maria de nostre dame’, and a secular text on love copied side by side, separated only by the rubric ‘Dou dieu d’amours’. 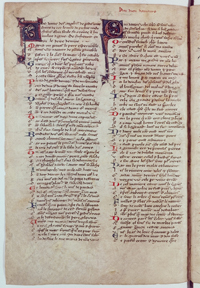 In open access: Karen Pratt et al., The Dynamics of the Medieval Manuscript: Text Collections from a European Perspective. Göttingen: V&R Unipress, 2017. Bart Besamusca, ‘The Value of Genre for the Study of Multi-Text Codices’. In: Medieval Romances Across European Borders, ed. Miriam Edlich-Muth (Turnhout: Brepols, 2018), 15-32. Bart Besamusca, Gareth Griffith, Mathias Meyer, Hannah Morcos, Hannah, Author Attributions in Medieval Text Collections: An Exploration, Amsterdamer Beitrage zur alteren Germanistik, 76 (2016), 89-122.